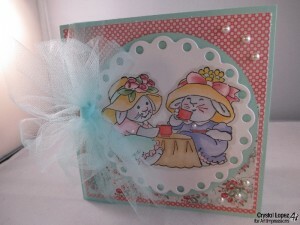 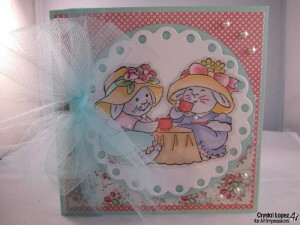 I wanted make another card for this challenge , I had this cute Tea Time stamp SKU # 4114 and wanted to ink it up. 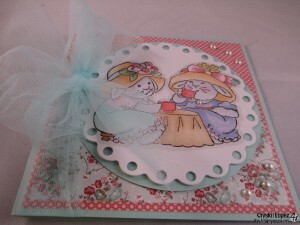 Aren’t these the cutest , they were really fun to color also.. 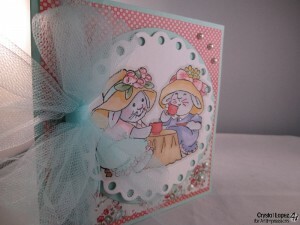 These Bunnies aren’t just for Easter , what little girl doesn’t love a tea party , so this would make a great birthday card , so this is what I create . 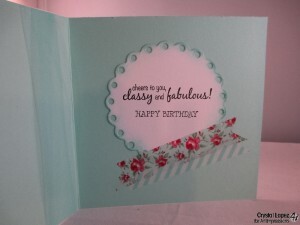 Thanks for stopping by , be sure to visit Ai’s blog again tomorrow and Piali will have another beautiful project to share with you.. My next posting day for Art Impressions will be Wednesday May 1 .